At Maplewood Laser Dental Clinic we use a variety of smile contouring techniques to quickly and effectively improve certain aspects of your smile. While we’re not talking about a complete restoration, we are using several techniques to get the healthy, beautiful smile you want. If you’re currently unhappy with some of the features of your smile, give us a call to see what we can do for you. Your teeth, gums, and lips all contribute something to the shape and feel of your smile, and we can provide the quick-fixes you need to start smiling again. Teeth – Cracked, misaligned, and discolored teeth can all affect your smile. We can shape your whole smile, which means we go beyond just whitening your teeth and work on the entire structure. Straight teeth are also a critical part of your overall health, so we’ll help you build a great smile on a healthy foundation. Gums – Too much gum tissue, or uneven gums, may make your smile appear a little crooked and increase feelings of self conscious. We want people to notice your shiny white teeth, not your gums, so we use our laser treatments to reshape and reposition the gum tissue exactly where it needs to go. This is a simple procedure and you’ll be back to most of your normal routines almost immediately. Lips – A simple grin or twitch of the lips can mean a lot. If you are concerned about blemishes appearing on your lips, we can help you get rid of them with our state-of-the-art equipment. 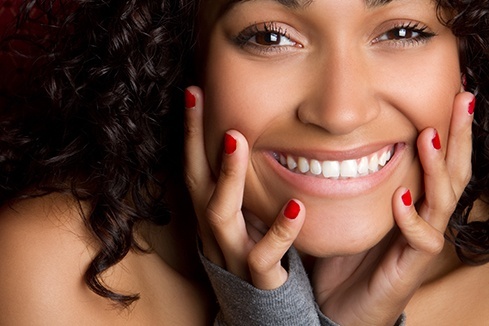 While smile contouring is basically an aesthetic procedure, it’s not all about appearances. Cracked teeth can make it hard to eat and overcrowding may make it difficult to properly clean them every day. Overgrown or asymmetrical gums may also cause discomfort in other ways. We will use our contouring techniques to get everything into its proper place for a healthy, functional mouth.